One of the most underrated and under appreciated powers of makeup is colour correcting. 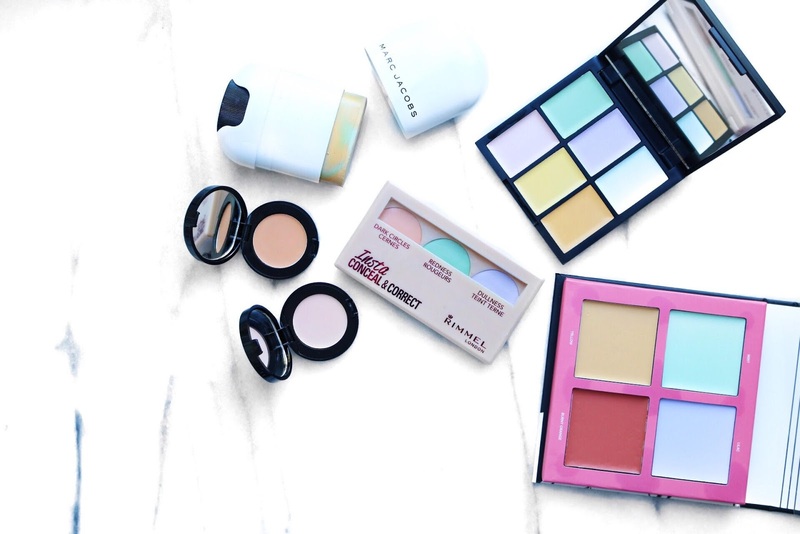 It sounds super complicated and admittedly a little bit faddy, but colour correcting is a proven method used to counteract complexion imbalances and conceal problem areas. Colour correcting works by targeting specific colours that appear in said problem areas. For example, purple and green tones are visible in dark under eyes, and red tones are visible in blemishes. These colours can be applied onto their respective opposite to help combat the following tones from shining through. Green- Cancels red. Perfect for concealing spots and blemishes. Yellow- Cancels purple. Fab for concealing purple toned under eyes. Purple- Cancels yellow. Neutralises and brightens dull yellow tones in complexion. Pink- Cancels brown. Ideal for brightening and hiding dark spots and discolouration. Orange- Cancels brown. Targets major league dark circles and dark spots on skin. Sleek have your complexion covered with this little beauty. I can't get over just how much you get of your money; containing six shades, this great palette has the answer to correcting each and every of your skin issues in one makeup bag sized product. Don't be afraid to mix colours to customise the correction to your skin needs and with the impressive range of shades in this palette, the combinations are endless. First things first, I've got to get off my chest how insanely cool this product looks. The sleek white packaging is totally crisp and flawless, making it look as expensive as it really is. It looks nice in your makeup bag, and that's a value in it's own right! The shade Cover(t) Affairs is a marbleised fusion of green, orange and yellow, making for the ultimate redness combating combination. Simply swipe across your complexion and blend for instant neutralisation of red areas and blemishes. This nifty palette contains the three key shades when it comes to colour correcting, orange, green and purple. Use orange to bust dark circles, green to hide redness and purple to brighten dullness. Viola, all of your complexion woes can be wiped out with one handy little product. Not only does it contain three different correcting tones but also a graphic guide of how to use the products and a mirror. Very considerate, Rimmel, very considerate. Makeup doesn't get much better than Bobbi Brown, and the brand's reputation for high quality products that deliver exactly what they promise is maintained in their Colour Corrector pots. These creamy products are available in a whopping 16 tones, so whatever your skin concern is, Bobbi Brown has the solution. I find the texture of these to be heavy enough to easily conceal but also lightweight enough to wear on a day to day basis. The thing that really makes me swoon? How creamy, smooth and blendable the Corrector's formula is. Lottie London well and truly came through with this killer colour correcting quad. It contains four colours - green, purple, yellow and orange - to ensure a naturally flawless complexion with ease. The buttery and blendable texture of the concealers is unbeatable and with this palette, I never have to worry about pesky creasing. It's also worth noting that the palette contains a generous amount of each correcting shade making for long lasting complexion perfection. I'm so late to trying colour correcting makeup, this post has inspired me to go and find some products I like. The Rimmel palette is definitely one I'm interested in trying!